Around this time last year, TransLink was revealing the details of the proposed Fraser Highway B-Line. This service was to provide limited-stop service every 10 minutes or better during peak periods, and every 15 minutes of better during the rest of the day. This Fraser Highway B-Line was cancelled after the fall municipal elections when light rail along King George and 104th Avenue was also cancelled, replaced by SkyTrain along Fraser Highway. The Fraser Highway B-Line was supposed to use articulated buses, have bus prioritization measures to speed up service, and have better bus shelters with real-time information. The rational for cancelling the B-Line was that with SkyTrain construction along Fraser Highway starting in a few years, it wouldn’t make sense to invest money into things that would be torn up in less than a decade. Currently, transit service is overcrowded along Fraser Highway. SkyTrain service to at least Fleetwood will be open in about 6 to 7 years at the earliest. With transit ridership continuing to increase, and with the current overcrowding of bus service along Fraser Highway, something needs to be done now to improve transit service along Fraser Highway. To improve transit service along Fraser Highway, TransLink is proposing to change how the 502 and 503 operate. Today, the 502 operates between Surrey Central SkyTrain and Langley Centre with local bus service every 6 to 8 minutes during peak periods, and every 15 to 30 minutes during the rest of the day. The 503 operates between Surrey Central SkyTrain and Langley Centre as an express route, with local service between Langley Centre and Aldergrove. Currently, service runs about every 30 minutes throughout the day. 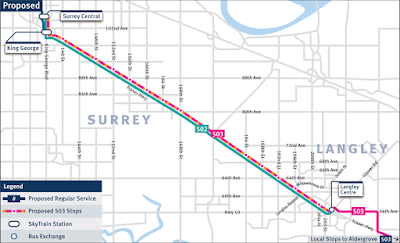 TransLink is proposing to make the 503 into a B-Line style route between SkyTrain and Langley Centre with limited stops at shown on the following map. Proposed changes to 502 and 503 bus routes along Fraser Highway. Select map to enlarge. This new 503 would run with articulated buses between Surrey Central and Langley Centre. It would run every 8 to 12 minutes during peak periods, and every 15 minutes during the rest of the day. For 503 service that extends to Aldergrove, the service frequency would remain the same. As a note, this is better than the originally proposed Fraser Highway B-Line which would have required people going to/from Aldergrove to transfer at Langley Centre to maintain fast bus service. The new 502 would continue to provide local bus service like it does today, but its frequency would be reduced to 12 minutes during peak periods, and every 15 to 30 minutes during the rest of the day. As a daily transit rider along Fraser Highway, I’m excited to see these changes implemented as soon as possible. My only concern is that due to extreme congestion in the Green Timbers areas, bus service can become inconsistent during peak periods. I hope that TransLink and the City of Surrey can figure out a way to prioritize bus service along this section of Fraser Highway while SkyTrain is being built. You can submit your feedback on these proposed changes to bus service along Fraser Highway online.